The modern metro city of Pune has been witness to consistent industrial development along with the growth in education, manufacturing and IT industries as well. But very few might be aware of the twin cities of Pune i.e. Pimpri-Chinchwad, taking a huge leap with its wholesale and retail flower markets. With over 12 wholesale markets and 120 floral shops in retail, Pune is flourishing in its flora business. One of the most sensational news leading to emerging floral markets of Pune is that the Agriculture Produce Market Committee (APMC) in Pune were looking forward to expand Pune’s floral presence by establishing an exclusive floral market and trading centre in the Gultekdi Market yard area. The design or layout that has been drafted is not satisfactory as per the needs of the growers and traders can be seen who are demanding more and better storage space with state-of-the-art facilities like air-conditioning, etc. to avoid any kind of damage to the flowers. But even with the undeniable rise in the costs from such demands, one cannot over look the fact that if the floral market of Pune is expected to match up to the standards of the world’s largest flower mall, then it is sure to cost more than a penny! Authorities have been heard to have agreed to this proposal and have been chalking out the revised layout along with the budgetary revisions. It is said to have an increase to about 10 crore more than the original cost of the budget devised leading to an approx spending of Rs. 40 crores. Not a very short amount is it? The flipside of this story is however that, with the markets swooning with establishing international standards and increasing the customer base for Pune’s florists, there are floral markets on the other part of the city at Mahatma Phule Mandai who are struggling to make ends meet. 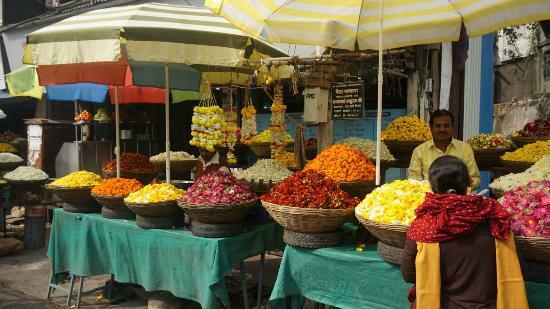 Keeping the historic vibes alive, this flower market lined on both sides of the road, marking its beginning from the Dagdhuseth Halwai Temple and ending near the Phule Mandai are experiencing tough times as Pune tries to establish its flower connects through modernization. The sad truth is that modern life and technological upliftment as well as improvement in infrastructure always has a downside and this downside is mostly faced by the lower sections of the society. An evident impact has been seen that has fallen upon the vendors of this area who 30 years ago had a flourishing market and sales were blooming. Now as reports suggests, there has been drastic fall of about 50% of their sales as most buyers bank on their business from the Market yard. “Looking back to about 30 years ago, the market here and the vendors were the main traders of flowers in the city. This was the wholesale flower market and it witnessed heavy footfall from smaller flower traders and consumers alike. But today, the clientele has dropped to almost half. From over 100 flower stalls in the area, less than 50 survive”. It is genuinely a very sad scenario although Pune cherishes with its growing floral markets and consumer base and believes it can cater to the needs of most vendors. However, the reality is strikingly harsh and far away from this. Owing to these two sides of the same coin, our motion rests that the online flower delivery in Pune has been growing in demand with the conditional factors persisting in the other segments of the market. Even with opening up of the biggest flower trade center, Pune witnesses sharp rise in the demand for online flower delivery in Pune due to its natural presence and glory of flowers in the city. With high PR strategies and news flooding all over, for opening of the new floral market and how it has affected the sales on old flower markets in corners of the city, it does not take much of a rocket science theory to understand that retail consumers are banking on steady shopping for flowers in Pune. And why will they not? Considering it is one of the most easy and convenient ways to get beautiful blooms delivered right at your doorstep. You do not even have to worry about fresh and hand-picked flowers as that is already taken care by the service providers themselves. What one may not understand is that the wholesale market for even this online flower delivery in Pune is directed towards the flower markets at the Market yard rather than the small vendors which automatically implies them losing sales. Not just that but with the innumerable varieties of flowers that are now available through online shopping, it is very difficult for the flower market sellers to match those standards. Nevertheless, it seems like with the prevailing circumstances, it is a win-win situation atleast for the online flower delivery services in Pune! So, good luck shopping blooms online!